Peninsula between the Black Sea and the Sea of Azof; now included in the Russian province of Kuban. It contains the Cossack settlement of Taman, which has (1897) a population of 4,291. The peninsula was the seat of prosperous Greek colonies at the beginning of the Christian era. That a large number of Jews lived there at that time and subsequently is testified to by the Byzantine historian Theophanes (d. 817) in his "Chronographia." 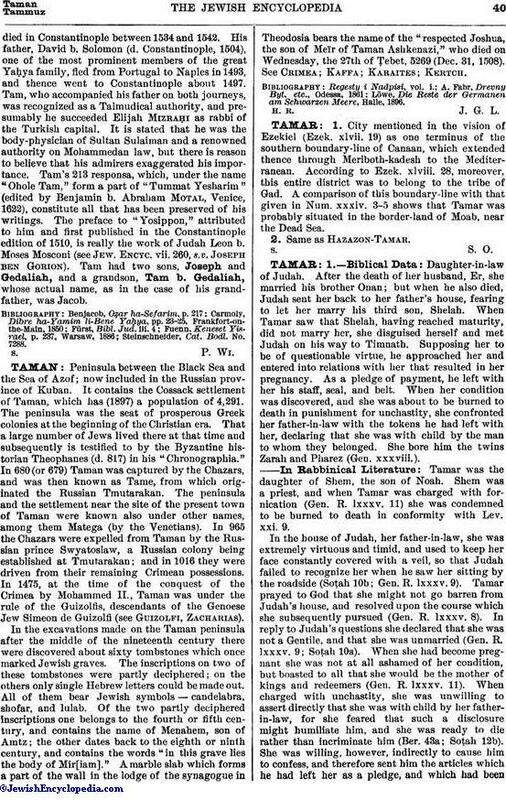 In 680 (or 679) Taman was captured by the Chazars, and was then known as Tame, from which originated the Russian Tmutarakan. The peninsula and the settlement near the site of the present town of Taman were known also under other names, among them Matega (by the Venetians). In 965 the Chazars were expelled from Taman by the Russian prince Swyatoslaw, a Russian colony being established at Tmutarakan; and in 1016 they were driven from their remaining Crimean possessions. In 1475, at the time of the conquest of the Crimea by Mohammed II., Taman was under the rule of the Guizolfis, descendants of the Genoese Jew Simeon de Guizolfi (see Guizolfi, Zacharias). In the excavations made on the Taman peninsula after the middle of the nineteenth century there were discovered about sixty tombstones which once marked Jewish graves. The inscriptions on two of these tombstones were partly deciphered; on the others only single Hebrew letters could be made out. All of them bear Jewish symbols—candelabra, shofar, and lulab. Of the two partly deciphered inscriptions one belongs to the fourth or fifth century, and contains the name of Menahem, son of Amtz; the other dates back to the eighth or ninth century, and contains the words "in this grave lies the body of Mir[iam]." A marble slab which forms a part of the wall in the lodge of the synagogue in Theodosia bears the name of the "respected Joshua, the son of Meïr of Taman Ashkenazi," who died on Wednesday, the 27th of Ṭebet, 5269 (Dec. 31, 1508). See Crimea; Kaffa; Karaites; Kertch. Löwe, Die Reste der Germanen am Schwarzen Meere, Halle, 1896.